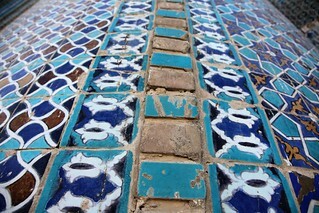 The intricate tile detail that gives Mazar-e Sharif’s Blue Mosque. MAZAR-E SHARIF, 08 April 2019 - The intricate tile detail that gives Mazar-e Sharif’s Blue Mosque its timeless beauty. UNAMA Photo / Sayed L Barez.